Holy St. Peregrine, please pray for all cancer patients, for healing and Blessings from our Lord. St Peregrine bless all l know with healing and happines In the name of the father. Pray for us, that we will have the courage to offer up our suffering in unity with the Cross. Pray for us, that the loneliness of our suffering will be consoled. I pray today for my children . Help me pray for them to live and see God’s fulfilment despite their dad leaving them at a very tender age. May they all get blessings with work and families at God’s own time. Bless my son. And grand son. Also dear St and brothers and sisters, last year i went through suffering in my job. My salary was cut drastically since September. I shared my sadness here. I have been told starting January it will be reinstated. I was so hurt. My heart is still heavy. Continue praying for stability in my work. I really love my work. But i was really hurt. I now understand with this Novena, that this suffering drew me close to God and my faith in Him. Actually i pray this prayers even though i go to Anglican church. With the mercy of God, and all the Angles and Saints please hear my prayers. Through the intercessions of St Peregrine intercede for me on behalf of my sister and brother in Christ Jesus; Anne, Charlie, Patrick, Blanche for a complete healing of cancer. This I ask in Jesus Holy name. Amen ???? 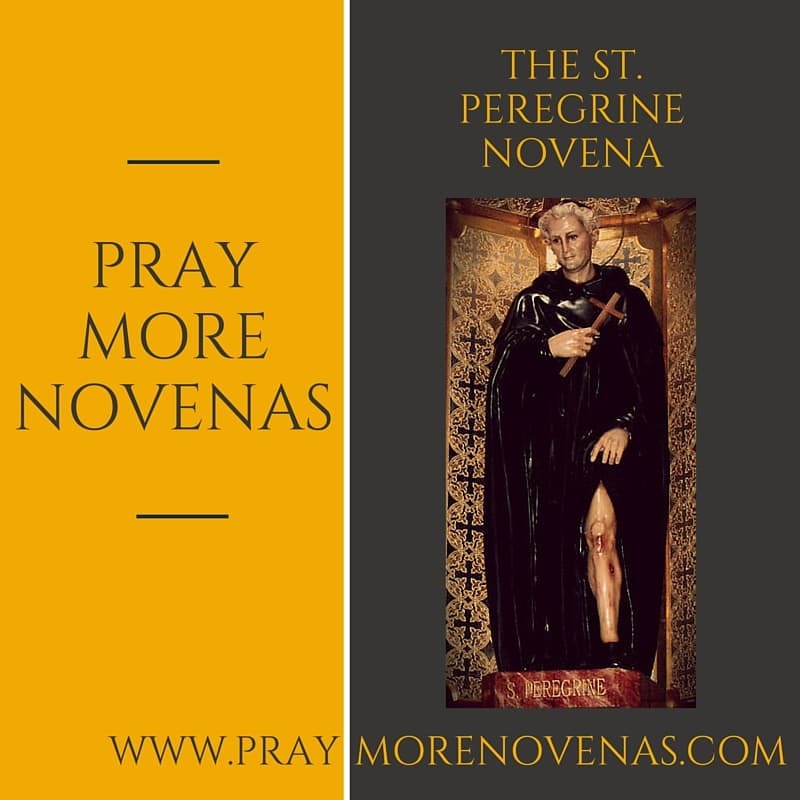 I ask for Our Lord’s mercy and compassion in hearing my prayers and all of the prayers being offered throughout this novena invoking St. Peregrine’s intervention on behalf of so many suffering friends and family members suffering with cancer. Especially I pray for Deb, Jeff, Lynn, Norb, Joe, and others whose names I may have omitted. St Peregrine, please pray for the healing of the broken relationship of mommy, nanay and daddy. Please pray also for the safety of everyone especially this rainy season to keep us safe always. Please St. Peregrine pray for my success in my studies so that i can graduate this April 2017. Nothing is more painful than family estrangement. I was estranged from my only child, but our relationship was healed, thanks be to God. Please pray for Luz L. for her remission and for her continued good health. And all I ask for is to receive good results from my cancer follow up tests every three months. Please help us in all our family with health Issues St Peregrine. In the name of the father. Please Lord help my daughter with her lung cancer give my daughter a second life.